Please go play FreeRice right now. It’s a great example of using gaming for some serious good. “FreeRice has a custom database containing thousands of words at varying degrees of difficulty. There are words appropriate for people just learning English and words that will challenge the most scholarly professors. In between are thousands of words for students, business people, homemakers, doctors, truck drivers, retired peopleâ€¦ everyone! FreeRice automatically adjusts to your level of vocabulary. It starts by giving you words at different levels of difficulty and then, based on how you do, assigns you an approximate starting level. You then determine a more exact level for yourself as you play. When you get a word wrong, you go to an easier level. When you get three words in a row right, you go to a harder level. This one-to-three ratio is best for keeping you at the ‘outer fringe’ of your vocabulary, where learning can take place. I saw this game mentioned in a couple other people’s blogs. I enjoy this a lot, although I spend most of my time at the same vocabulary levels, so I’m starting to learn some of the answers by rote. Correct answers used to get 10 grains of rice each; I guess after 7 weeks in operation the game designers had enough financial info that they figured they could change that to 20 grains. This makes me wonder… how many grains of rice does it take to make one bowl of cooked rice? The internets report that there are anywhere from 1000 to 10000 grains of rice in a cup. Of course it matters if it’s long grain or short grain. And this answers why/how they upped the grain amount. It is encouraging to see the rice # updated. I might be a wet blanket, but I don’t have enough fun enlarging my vocabulary to justify my time with this and rice is so F-ing cheap, you’ve gotta show more rice donated to make me feel like it’s doing good. What would make this awesome is if it enlarged into some Superbowl of Vocabulary complete with prizes, funky uniforms and video I can watch. Give us geeks some rewards, toss in a few lusty cheerleaders, and then I’m in. What an awesome concept. 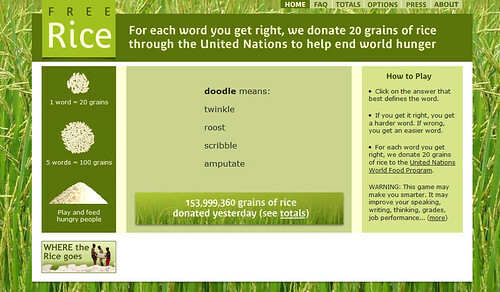 I tried it out and was able to donate 200 grains of rice. It isn’t much but the idea has great merit. This is great!! Is there anything else out there like this that is also legit? I’m sure there are similar games out there, but I don’t know of any offhand. We could use a directory of these types of social good games, though. What would make this awesome is if it enlarged into some Superbowl of Vocabulary complete with prizes, funky uniforms and video I can watch. Give us geeks some rewards, toss in a few lusty cheerleaders, and then Iâ€™m in.